Soccer Season Outsourced is an online coaching library with 20 pre-planned practices and hundreds of drill combinations. If you coach youth soccer but don’t have the time, desire or ability to plan effective practices, access to Soccer Season Outsourced is all you really need. It’s all online, and accessible from your phone or tablet. 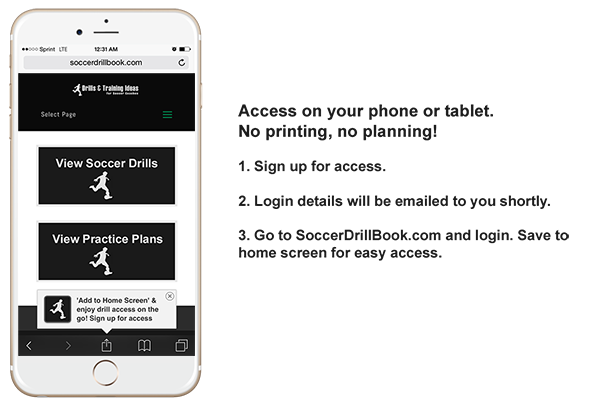 Just show up to practice, pull up this site, login, and run one of our 20 pre-planned soccer practices, or even craft your own using our drill library. Hundreds of coaches all over the world have already signed up for Soccer Season Outsourced, used it, and loved it. 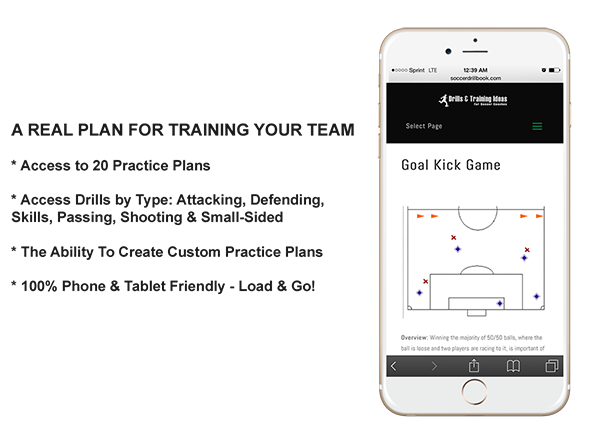 Now, your team can be the next to benefit from this amazing soccer drill & practice planning resource. 12 progressive training sessions to use in order, 8 to supplement during the season as needed. The progressive practice run through a solid drill set, while the 8 supplemental practices are topical in nature. We have organized the drills by focus into an easy to filter library. Plus, we have included countless variations and even coaching tips to help you focus on the most important concepts of each drill. It’s all right there on your phone. In my youth soccer days I played for many coaches, each with different levels of soccer knowledge, coaching experience and ability. I was always the type of player who thought about the game and analyzed it, and you can believe me when I say I knew what set my good coaches apart from the mediocre ones. My good coaches had complete control of the team. They had a plan for practice that improved each player’s skills and understanding. In short, they knew what they wanted to cover in each practice, and they set in motion a drill set that would achieve their goals in the small amount of time available each week. When I started to coach, I put serious time and effort into planning my practices, and I know that not all coaches have the time and knowledge that I have. At the end of my 2nd season of coaching (my team went 9-1 in league play), I decided to put together a simple plan that all coaches, regardless of how much time they have to plan and study, could improve their players skills and understanding of the game. The best coaches aren’t necessarily always the most knowledgeable but rather the most organized, empowered and adaptable. There is a limited amount of time for your team to practice each week so it is very important to maximize the time you do have. Having a plan for soccer practice is vital to your success because it will allow you to effectively cover everything that you need to in order to further your players skills and understanding of the game of soccer. The order of the practices and the drills within them have been laid out with careful consideration and are designed to make sure your players develop fundamentally before advancing on to more complex concepts of team play. If you run these drills, the kids on your team will enjoy practice, and improve their game. With Soccer Season Outsourced, the drills will start at the most elementary level and move forward in logical progression. You will be able to easily adjust the speed at which you move forward based on the age and competitiveness of your league and the abilities of your players. Balancing the aspects of fun and work is a vital part of being successful in improving your team. These factors are each reflected within the practices in this manual. Any good coach knows that while it is important to get in work at soccer practice doing specific training exercises, your players must also maintain interest in the drills. The minute practice stops being fun, players stop learning, and they may even quit showing up completely. Players love to scrimmage, but if you spent all of your practice time scrimmaging your team would not learn much. By following my plans your players will build ball skills, improve game understanding, work as a team and build a love for the great game of Soccer. The drill bible will allow you to supplement and meet the needs of your team, or add in some of your own favorite drills. Learning is fun, and players enjoy being challenged. My coaching plan will take care of everything! It’s 100% online, easy to use on a phone or tablet, and if you buy now, you get immediate, lifetime access.